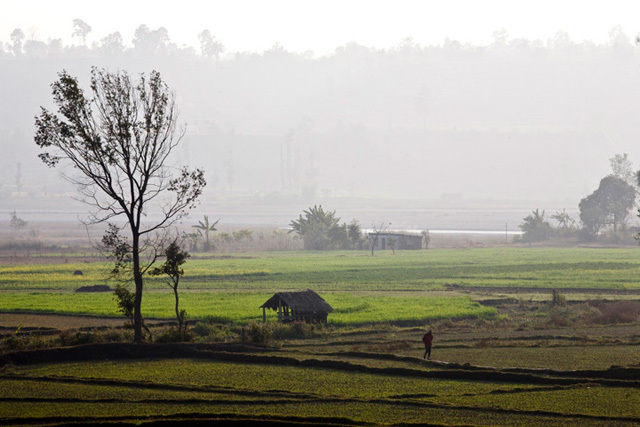 Nepal and Others Mull Monsanto’s Role in Advancing Agriculture | "Global Possibilities"
Kashish Das Shrestha Farmland in Nepal’s Makwanpur district. Here’s a quick update on efforts to expand access to higher-yielding hybrid seed in Nepal. Even though the country already has lots of different varieties beyond their own traditional supplies, a recent plan to expand access to higher-yielding seed, facilitated by the United States Agency for International Development and involving Monsanto, hit a big roadblock, as was explored here not long ago (“In Nepal, Farmers Struggle as City Dwellers Fight Monsanto“). Below you can read reactions to this situation from Pamela C. Ronald, a professor of plant pathology at the University of California, San Diego, and her husband Raoul W. Adamchak, an organic vegetable farmer. Together they are authors of the eye-opening book “Tomorrow’s Table: Organic Farming, Genetics, and the Future of Food” (which was praised by Bill Gates). Because we are food insecure to some extent we do feel that we should use hybrids. Second thing is, there is tremendous pressure from the companies too. If there is a provision to file an application then companies will and have been filing applications. So we can’t pick and chose. There is no denying the companies are quite influential. Personally, I feel even hybrids need to be kept within a restriction—the quantity we use, the space we allocate and the regions we pick, that has to be clear. If a company like Monsanto comes it will eat us whole. Which is why we need to be aware from the start; this is an extremely sensitive issue for us. We cannot accept hybrids just because China or India does so because their capacities and ours are starkly different. They can chase a company out, but not us. Our budget is dependent on the donor community and we are generally weaker. Yes, we need hybrid for food production. Sure, the companies need to do some business too. But it needs to be restricted…. If an organization like USAID wants to help us with a company like Monsanto, we would hope that they would help us to actually develop our own hybrids instead, not to import their foreign seeds. Hybrid seed yield more and require less pesticides (because they carry robust traits for resistance to pests and disease) as compared to open-pollinated seed. Because farmers reap both environmental and economic benefits, most farmers in the U.S., including organic farmers, purchase hybrid seed. The drawback to hybrids is that the seeds saved from hybrids are not very productive. To maintain productivity, farmers must purchase new seed each year. It seems reasonable then to run a pilot project for “20,000 farmers and include training on hybrid maize production practices and facilitate linkages between producers and end-users.” That way farmers can evaluate for themselves the costs and benefits of the seeds. Let the farmers decide. The important question are much broader than whether to plant hybrids or not. Do the seed promote food security so the Nepalese can reduce imports? Do the seed enhance economic stability of Nepalese farmers? Do they seed reduce the use of insecticides and pesticides, thereby enhancing health of farmworkers? This seems reasonable diversified and should allay fears that Nepal will be reliant on a single company, Monsanto. If this is the main concern, suitable regulations could be developed. Another point to consider is the potential benefits of fostering a home-grown hybrid seed industry, which would reduce reliance on foreign companies and produce another source of income for the Nepalese. I’m an organic vegetable grower in California and plant over 50 different varieties each year. Some of those varieties are hybrids because they have traits like yield, pest resistance, or flavor that make them far superior to open pollinated (OP) varieties. While hybrid seed usually costs more than OP seed, it is a small proportion of overall costs of production. For example, I buy only hybrid sweet corn seed, usually a variety called Vision ($26.90/lb). It is a supersweet variety that is delicious and maintains its sweetness for up to week. I use it for my CSA (subscription produce system), where I can put it into baskets each week without icing it, and be sure that when my customers eat it in a day or two, they will be happy. There are no OP sweet corn (e.g. Double Standard from Johnny’s Selected Seed @$18.60/lb) varieties that even remotely compare to Vision. I think of OP varieties as “cow corn”, tough, chewy, lots of corn flavor, and little sweetness. No, I can’t save seed from Vision, but I wouldn’t want to save seed from the OP variety. I don’t grow field corn, which is the crop at issue in Nepal, but virtually all of the U.S. field corn crop is from hybrid seed. The reason growers, organic or conventional, chose hybrid corn is yield, uniformity, and disease resistance. If only OP corn was grown here, yields would be dramatically lower, resulting in poorer farmers and more land in production. To insist that growers in Nepal only grow OP corn is to insist that they remain poor, subsistence farmers. Nepal is presently a net importer of food. Land degradation due to population pressure is an increasing problem. Without improved seed and increased yields, the situation will only worsen. Producing hybrid seed is a scientific advancement of the last century. Many seed companies around the world, in Japan, Europe, India, China, and North America, produce hybrid seed. If Nepal wants to develop its own hybrid corn varieties in the name of local food and ag sustainability, it wouldn’t take more than one university-trained plant breeder, a field site, and 5 to 10 years to produce productive hybrid varieties suitable for Nepal. I encourage farmers in Nepal to evaluate existing hybrid varieties to see if they meet their needs and do it in ways that minimize risk. They need to know if hybrid varieties increase yield and/or reduce fungicide use, if they are cost effective, and if they meet the demands of their customers. I also encourage them to use crop rotation, cover crops, compost, crop diversity, and use practices that support beneficial organisms. Improved seed is only one facet of sustainable farming. Most importantly, farmers need to be at the table to help decide what is sustainable for them and for the country.